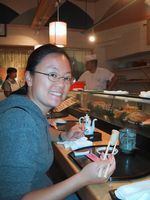 October 15th was the last day of our 9 month trip to Asia. 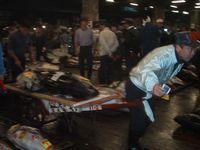 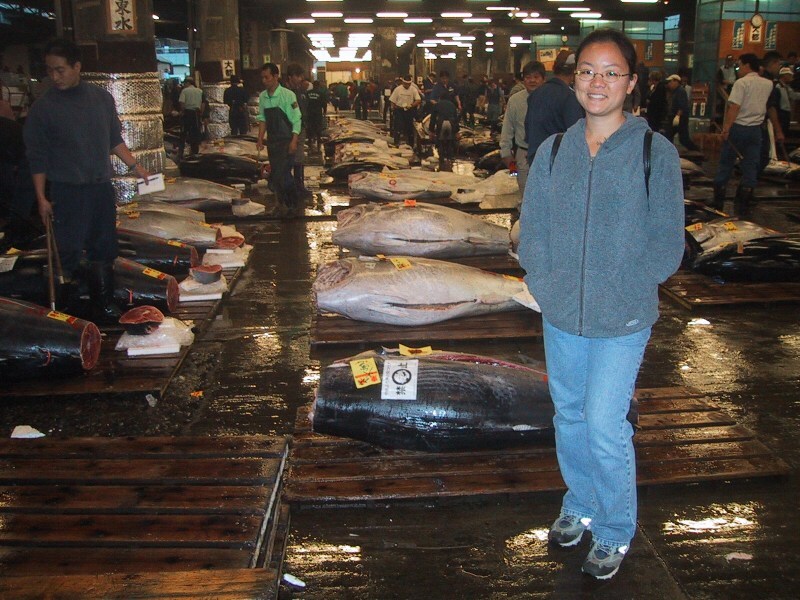 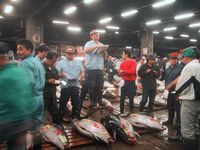 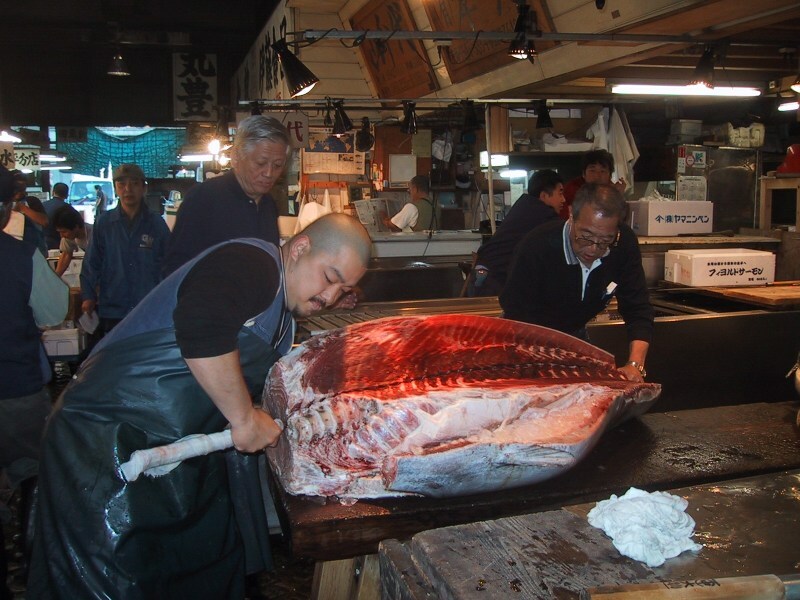 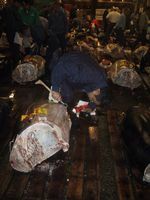 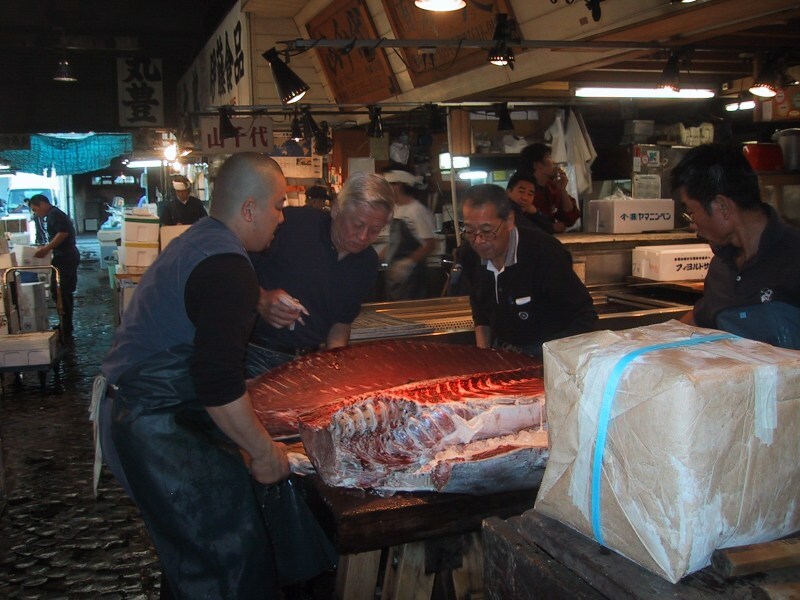 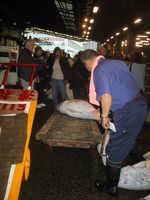 We got up very early in the morning - 3:50 a.m. to be exact - to make it to the Tokyo fish market to watch the morning tuna auction. 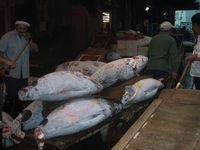 The cabbie picked us up at 4:30 am and took us on our most expensive cab ride ever. Well worth the money since we wanted to arrive at the market before all the action was over. 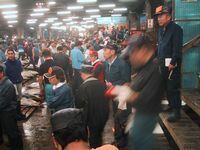 At the fish market, hundreds of vendors set up stalls selling myriad types of fresh seafood. 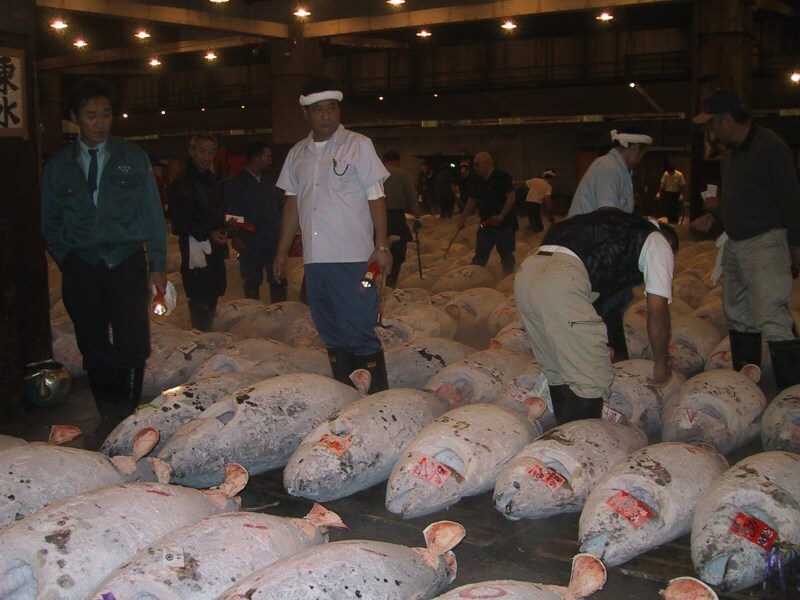 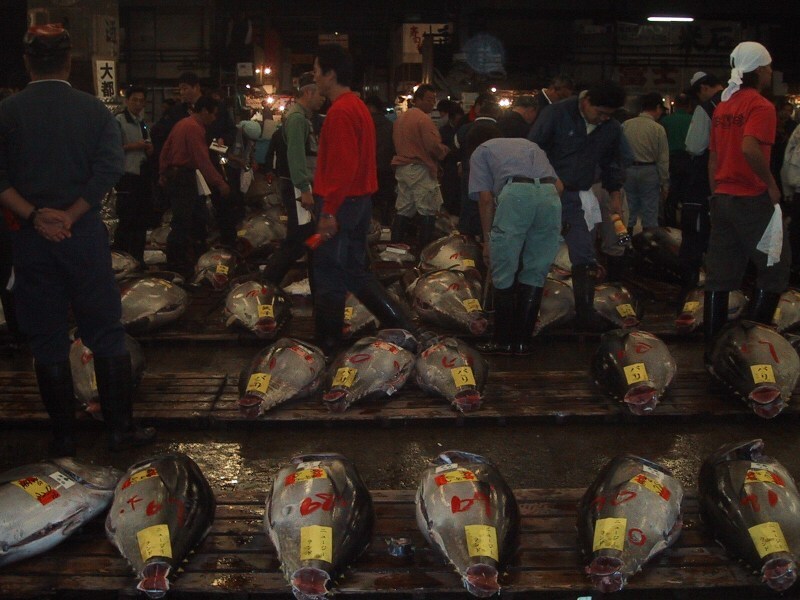 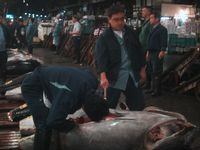 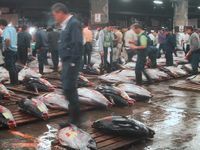 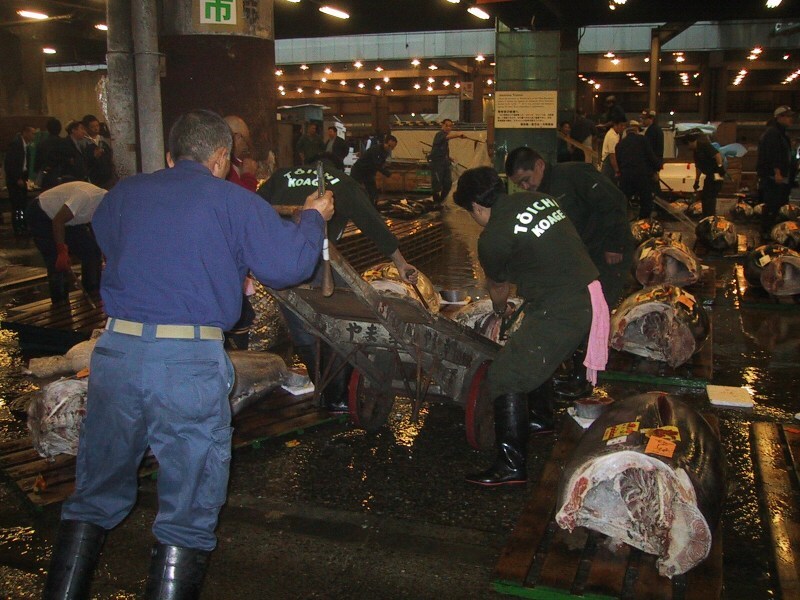 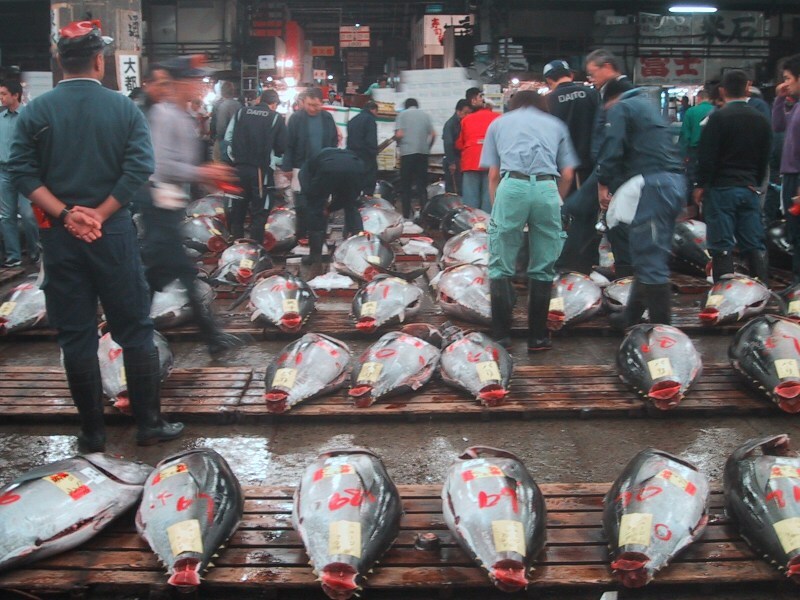 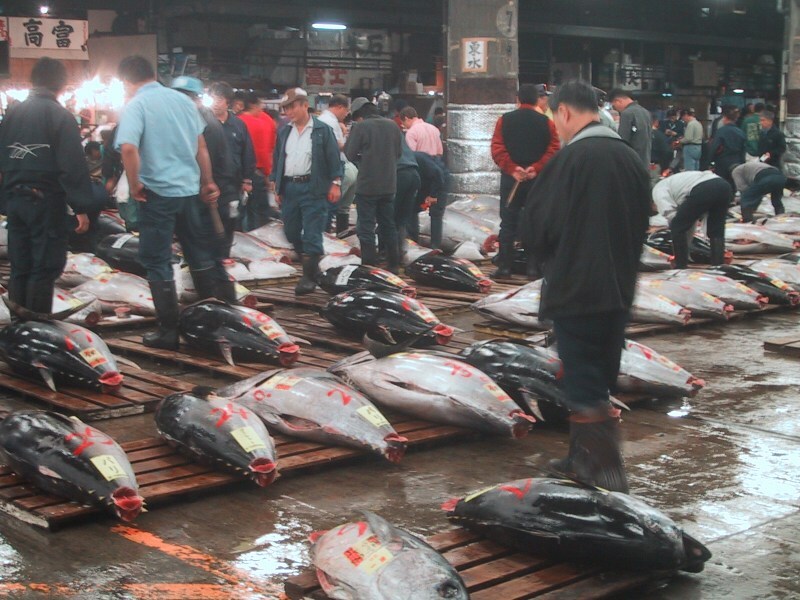 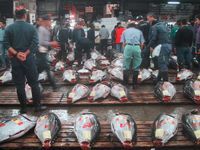 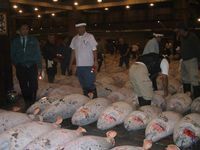 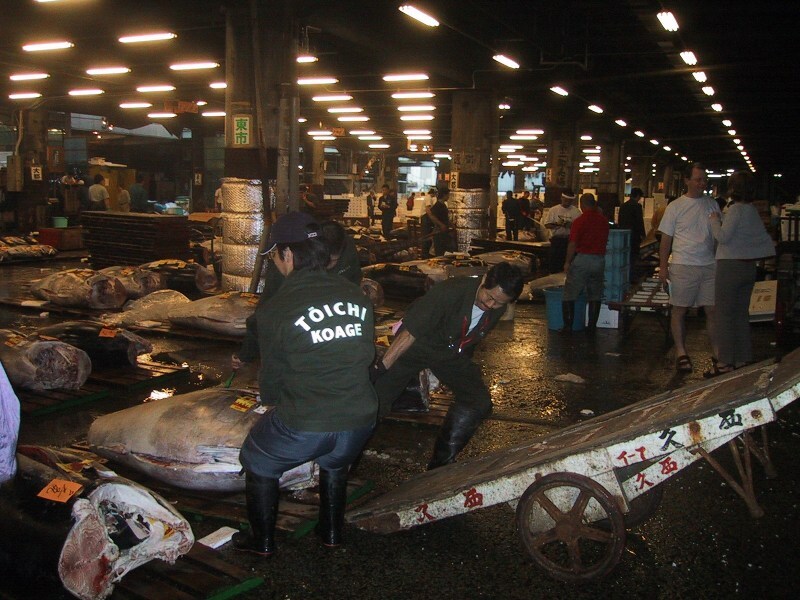 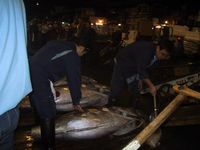 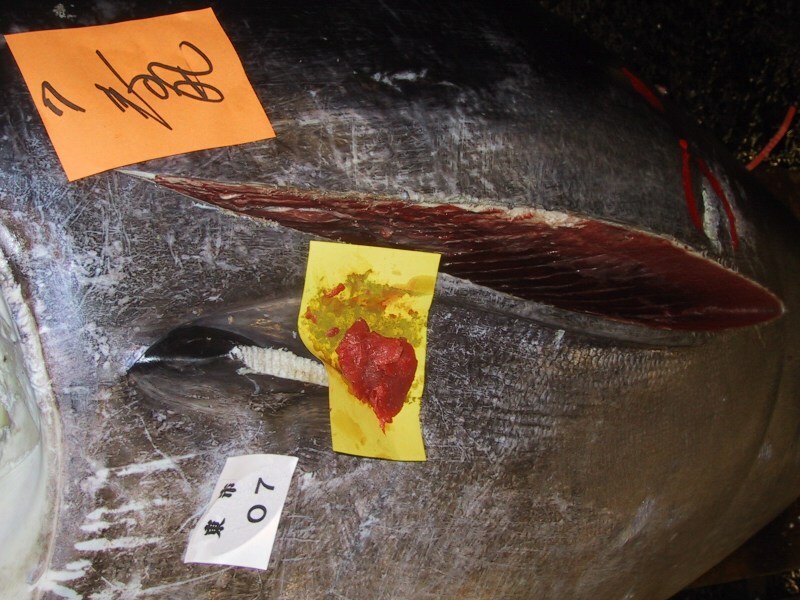 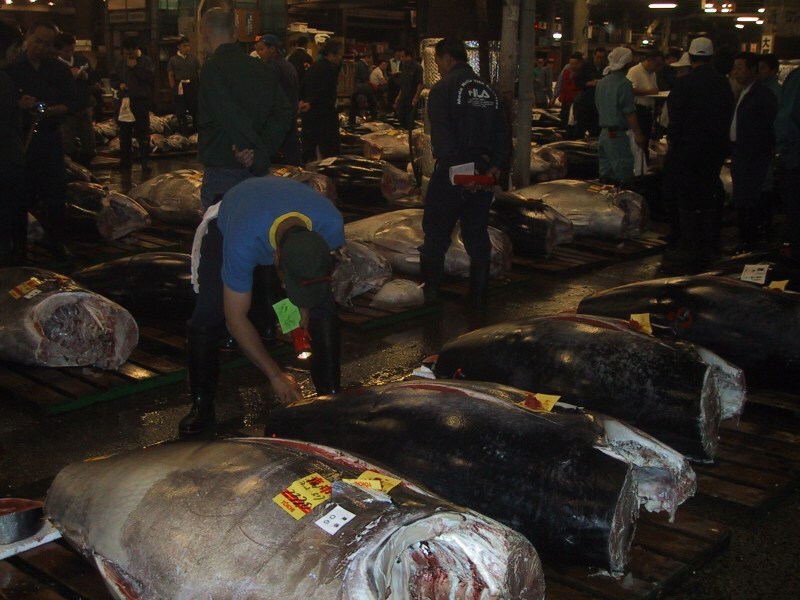 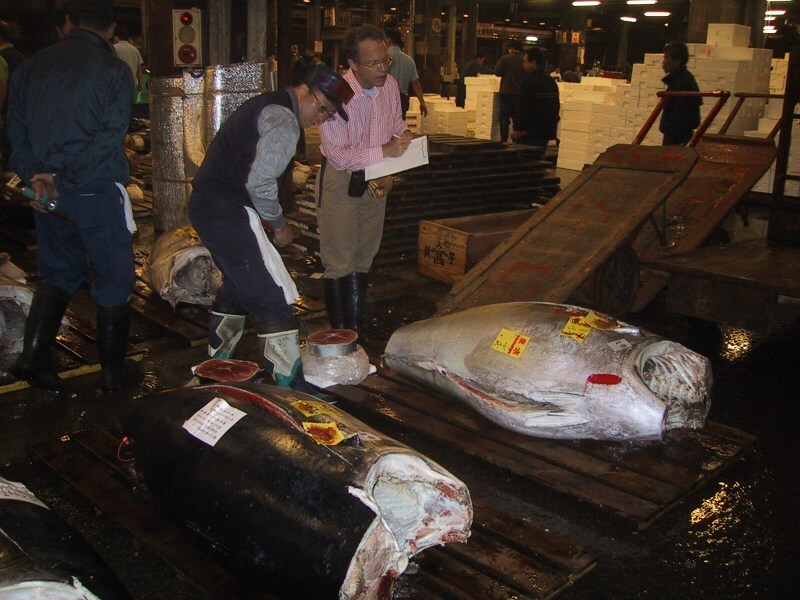 The biggest event of the morning, however, is the tuna auction, at which hundreds of freshly-caught tuna are auctioned to the highest bidder. 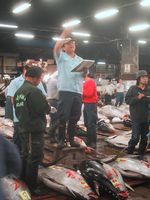 The auction begins at 5:30 a.m. and it's important to get there early enough to see the fishmongers preparing the huge, quick-frozen whole tunas before the auction begins. 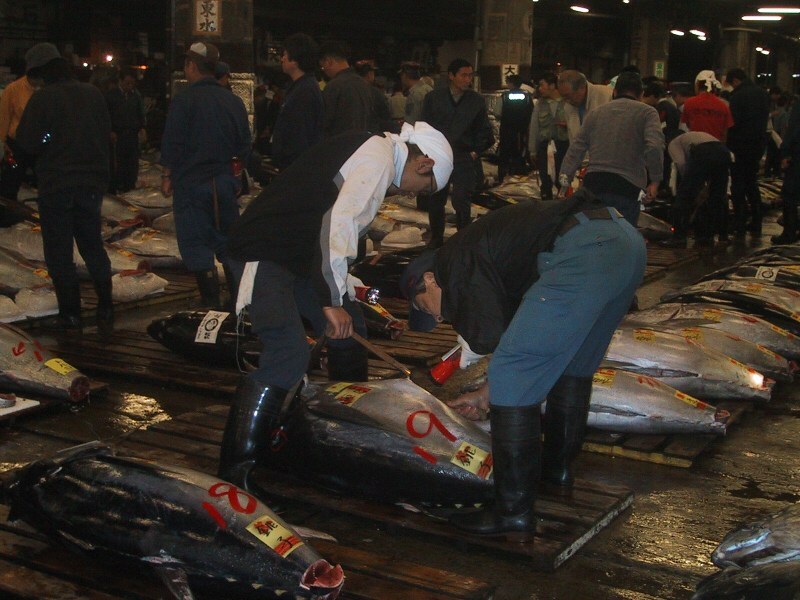 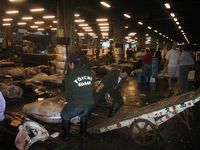 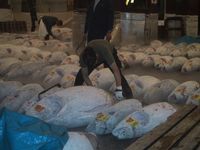 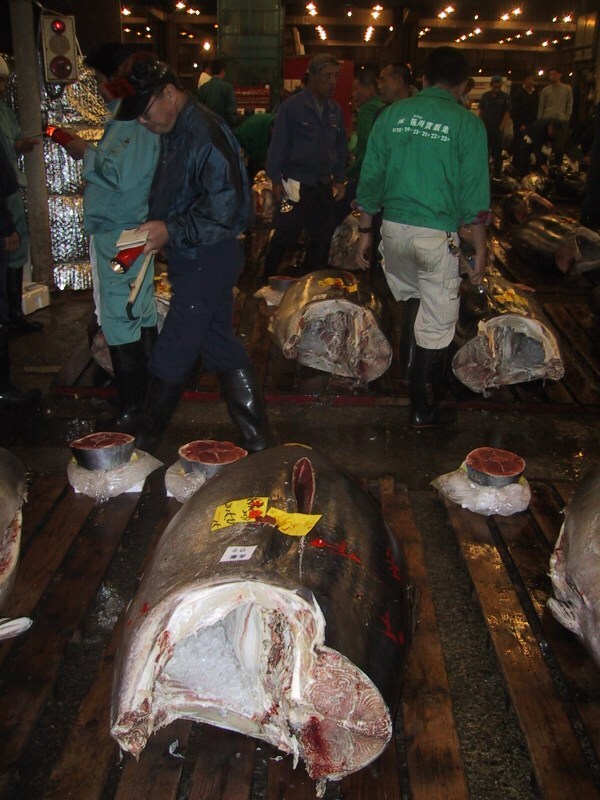 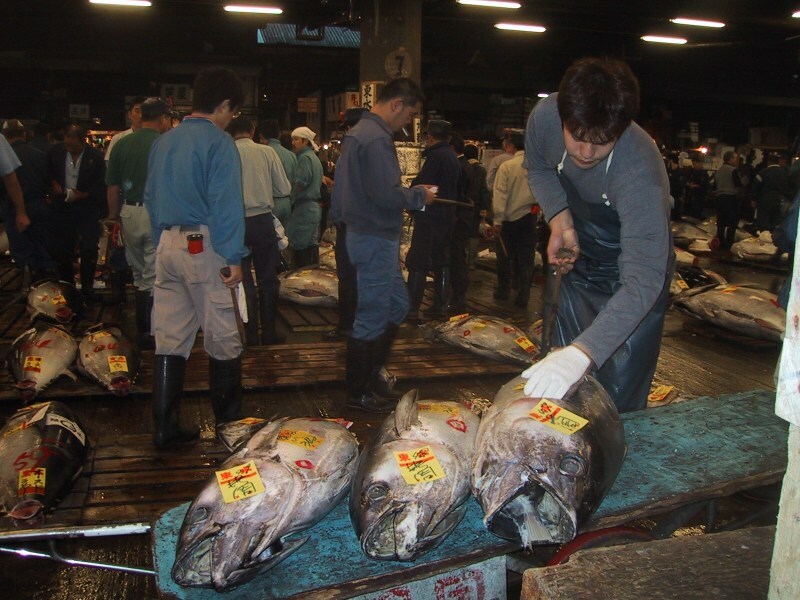 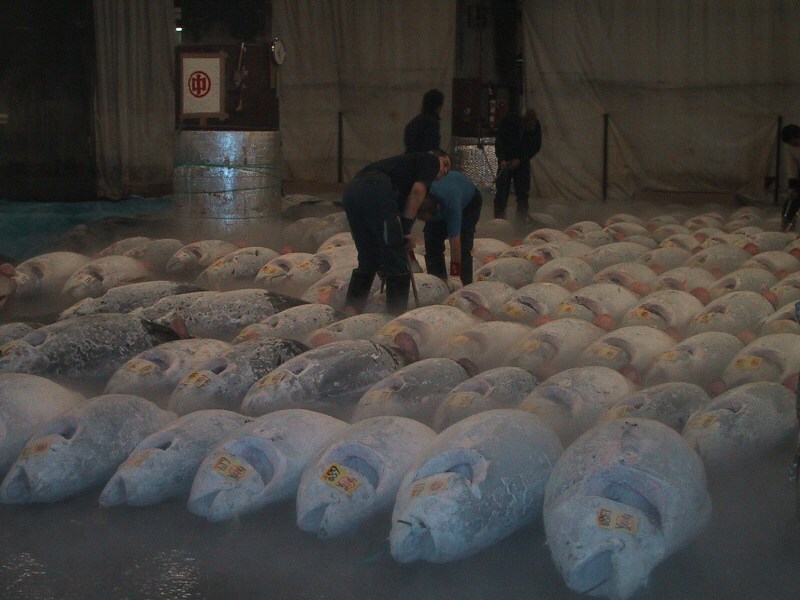 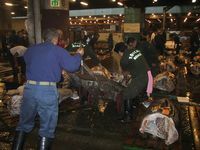 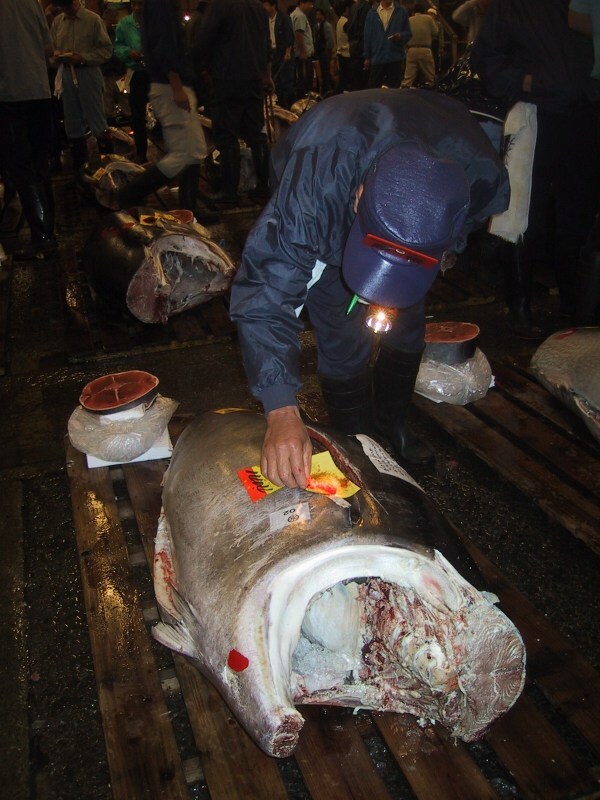 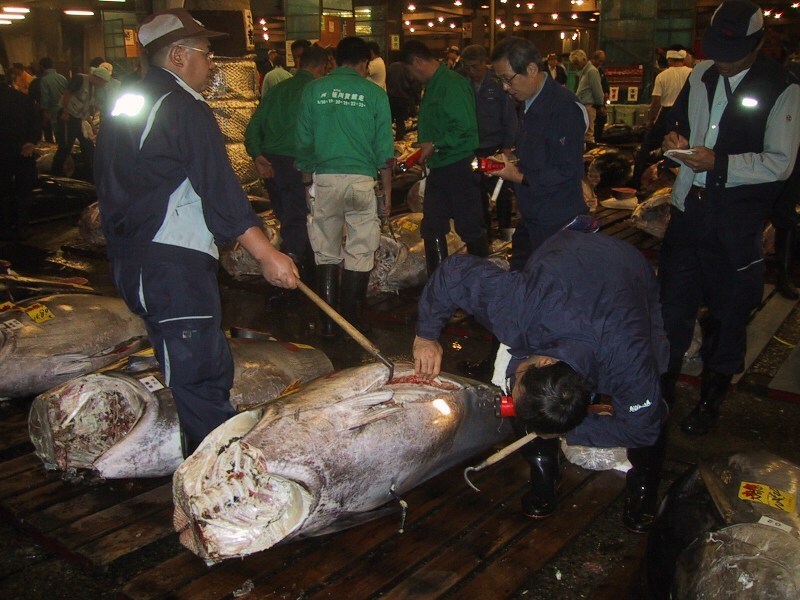 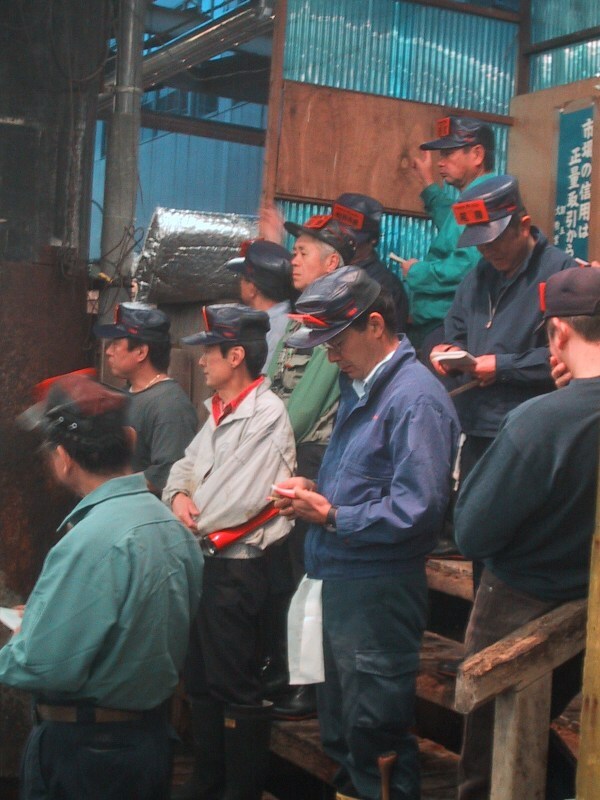 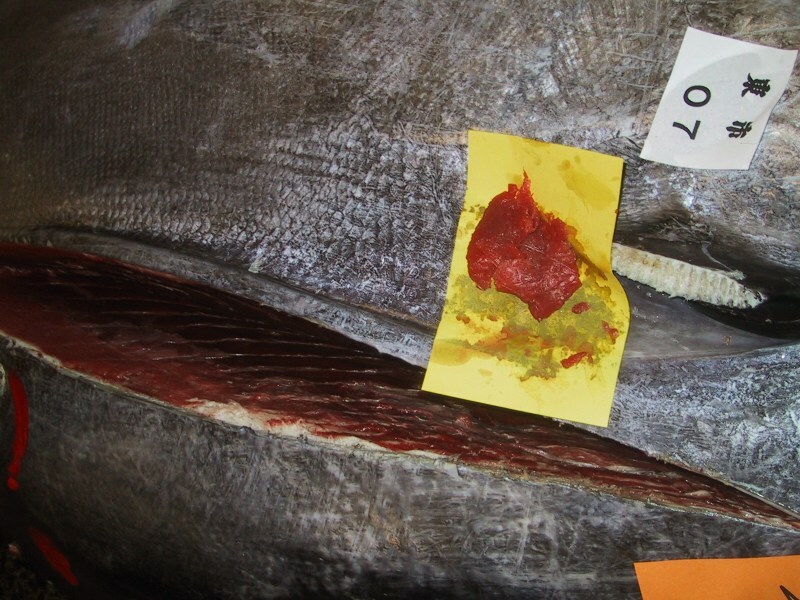 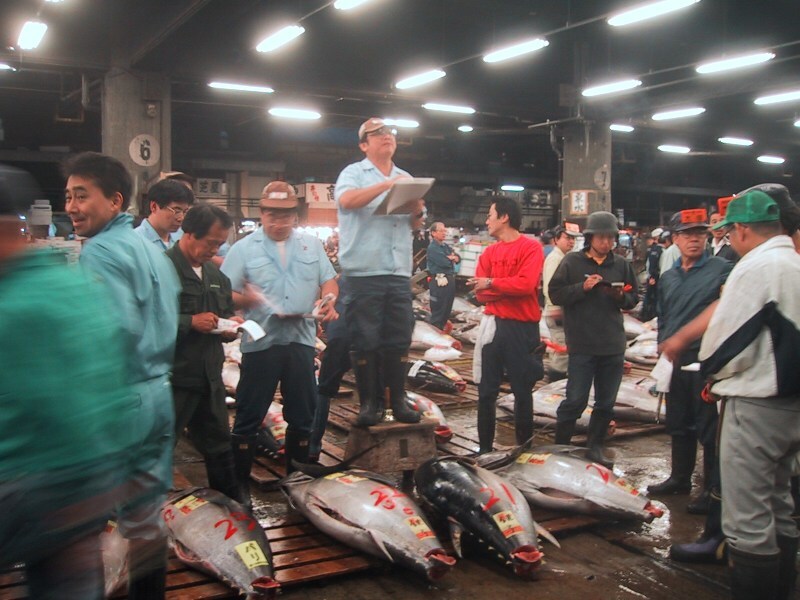 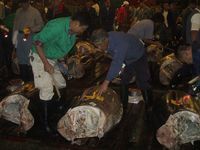 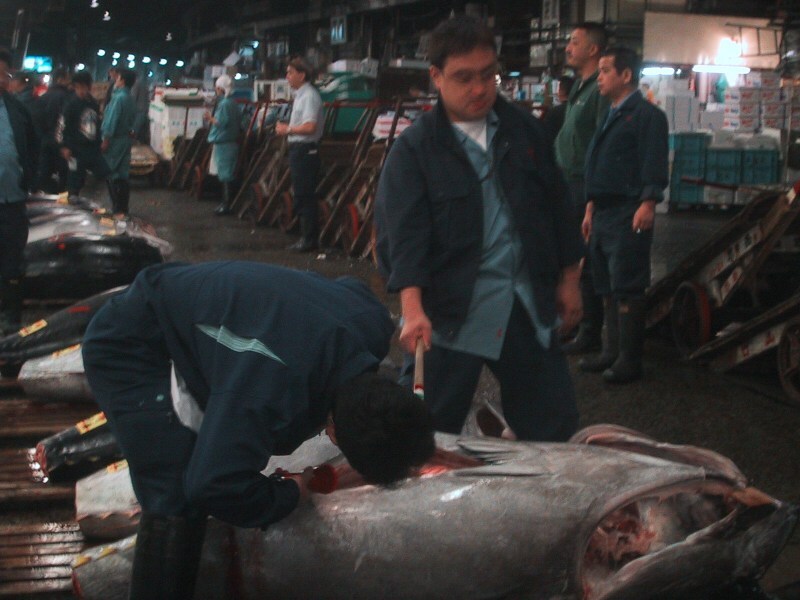 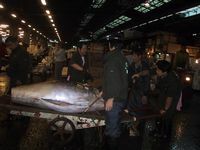 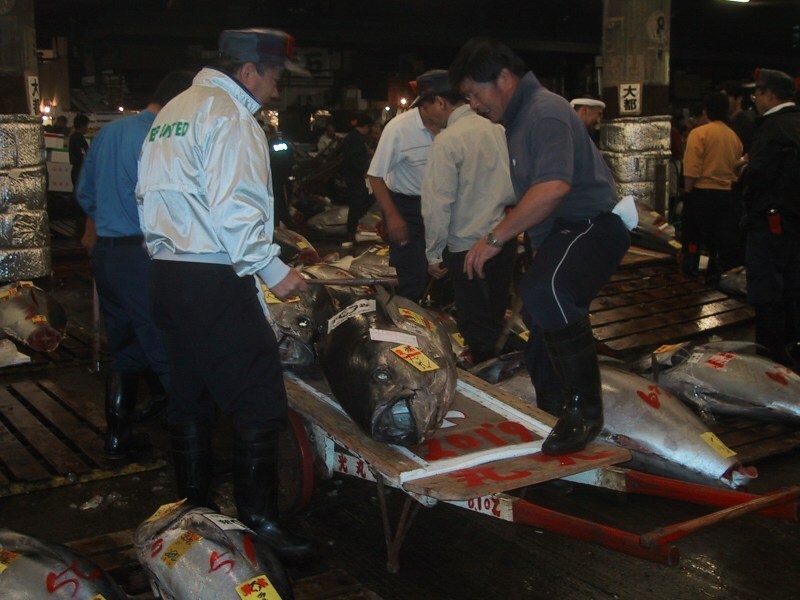 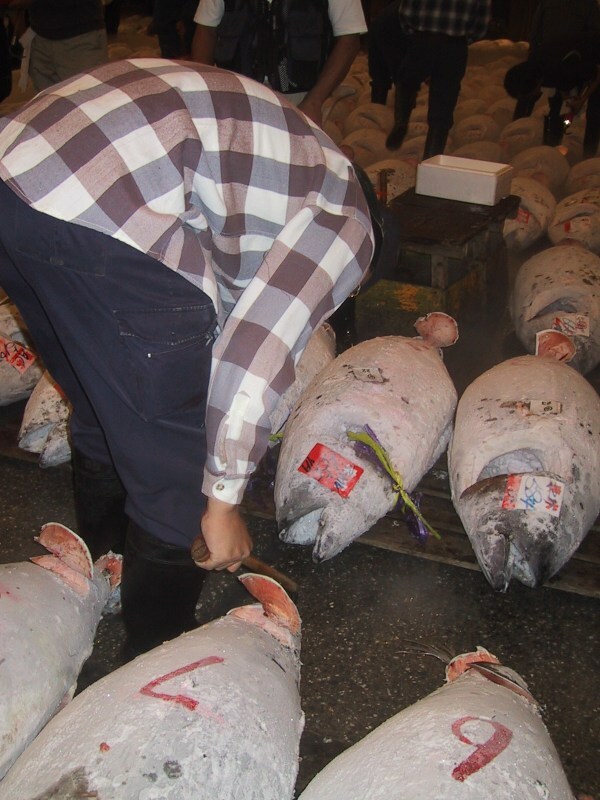 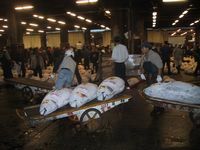 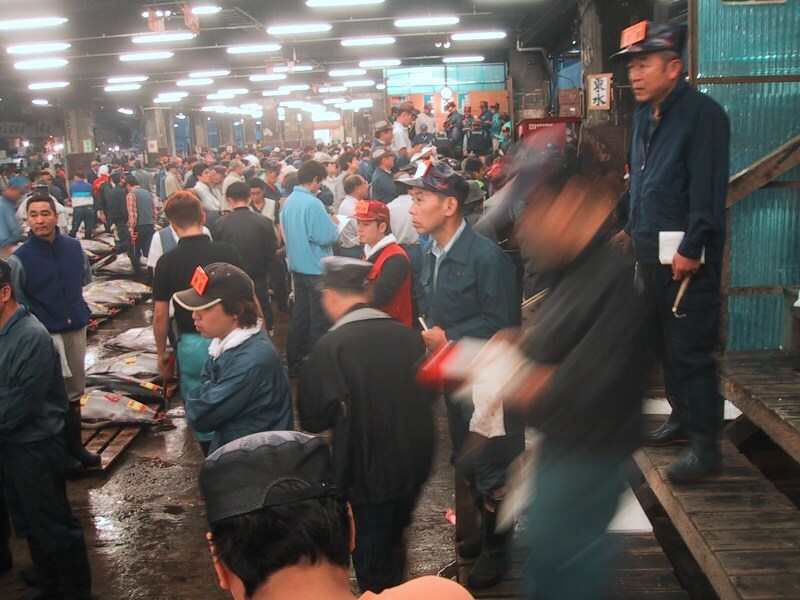 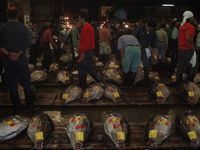 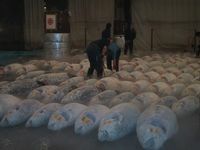 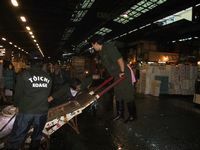 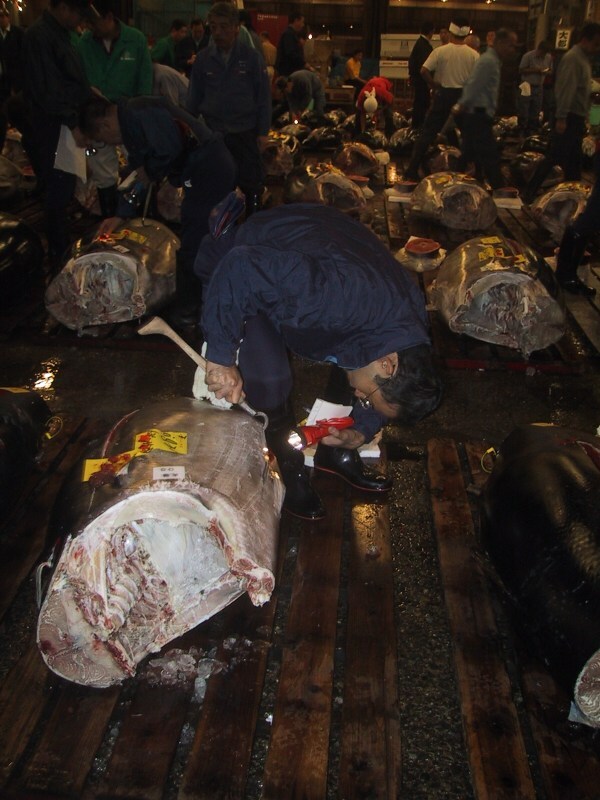 Dozens of workers attend to the rows of frozen Tuna while auction attendees peruse the fish, checking for quality and deciding on their bid prices ahead of time. 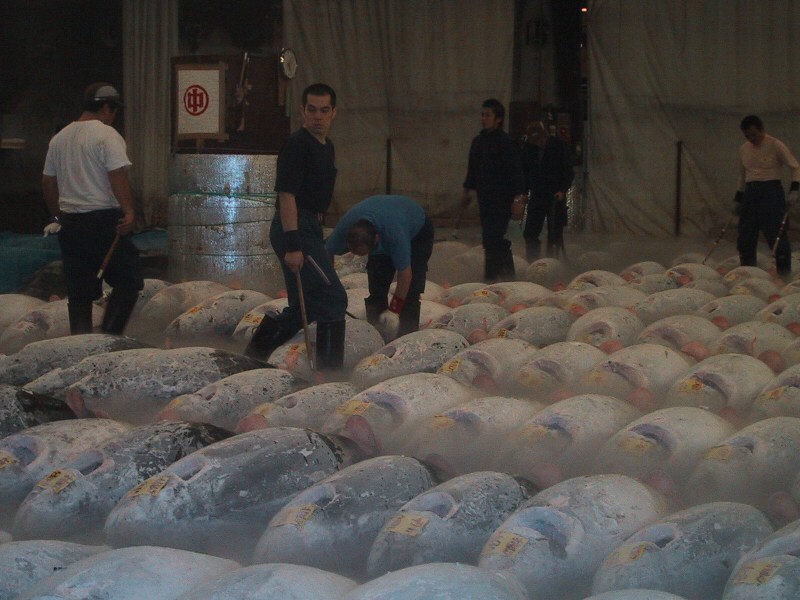 Some of the Tuna is sold frozen, presumably in order to ship it to all parts of the world. 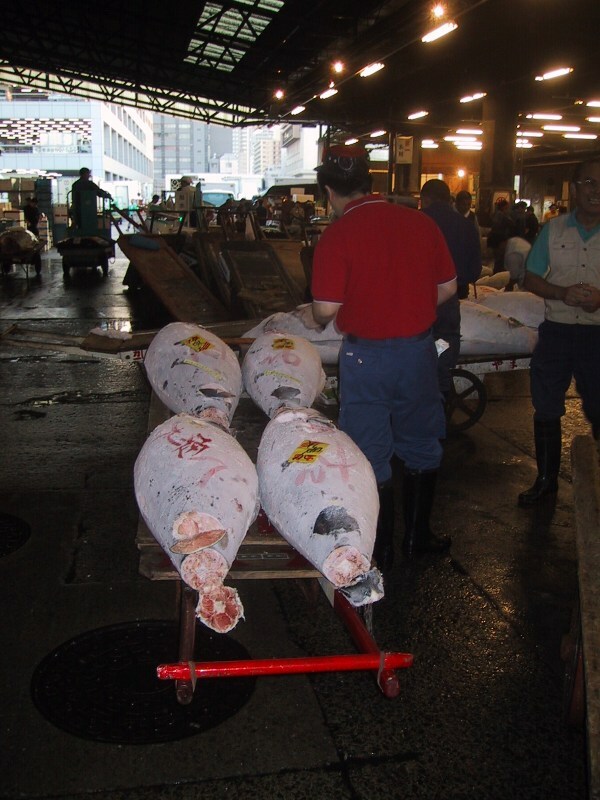 Here are the fresh tunas. 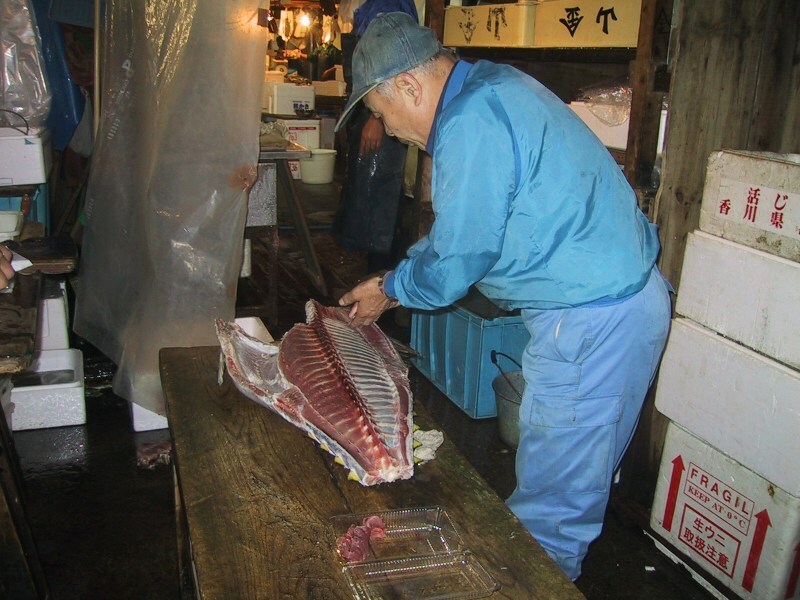 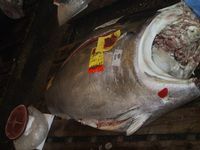 The buyers walked around inspecting, prodding, and tasting the fish. Ooo...the fish looked so tasty! 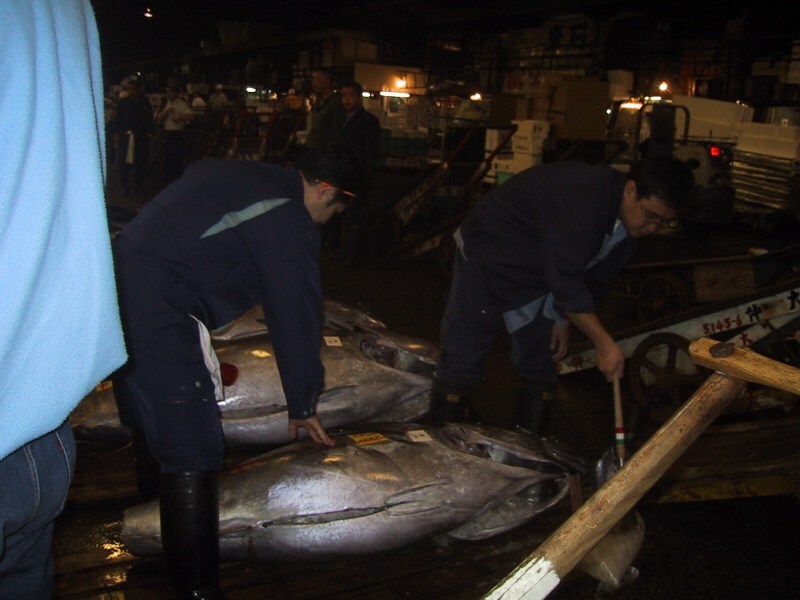 We were absolutely amazed at the size of the tunas. Some were quite a bit larger than a person. 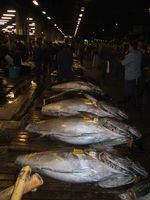 The biggest ones of course had the highest value, from $5,000 and up. 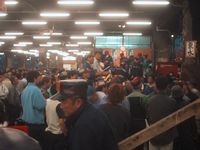 Here are lots more photos of the pre-auction preparations. 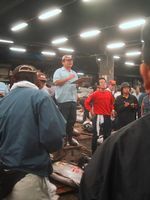 Finally the auction began. 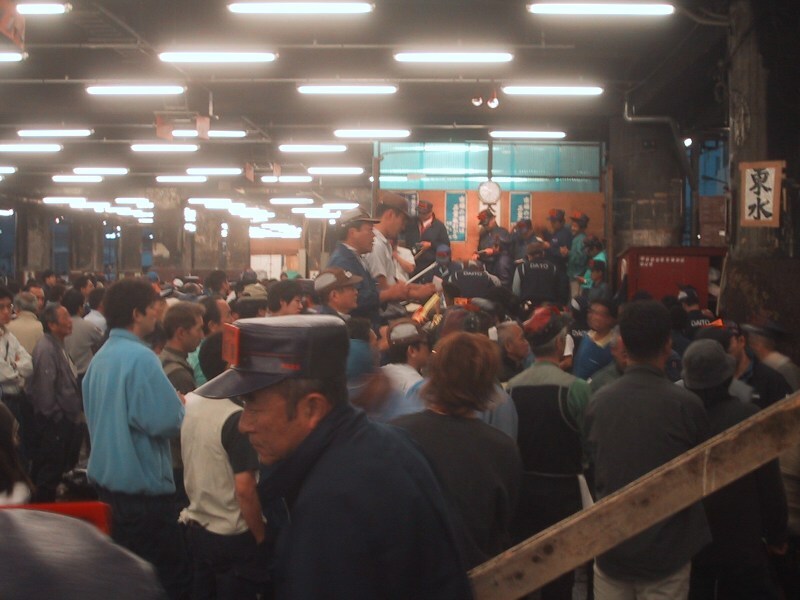 Actually, it was several auctions at the same time. Each auctioneer had has own canter, and his own style of making calls. 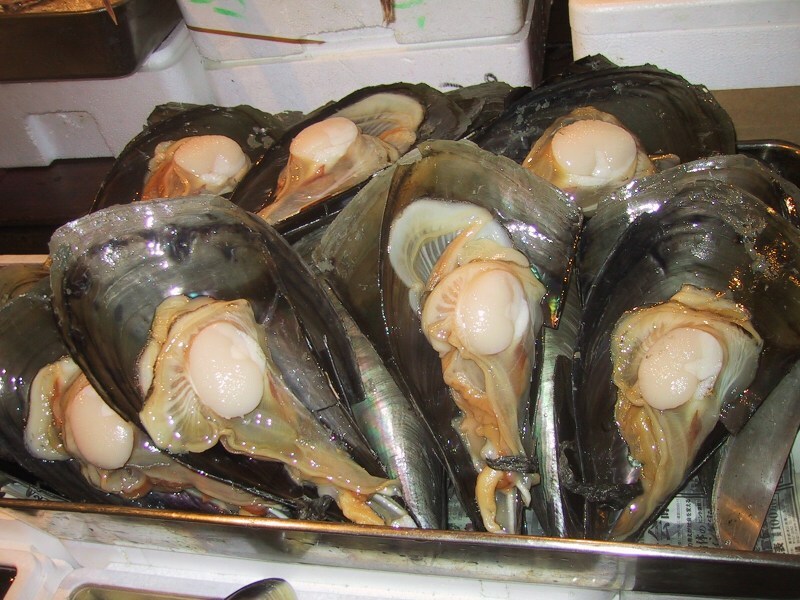 They all sounded strange to us, but were definitely unique. Nancy tried to bid on a fish to take home in her suitcase, but Bryan put his foot down. 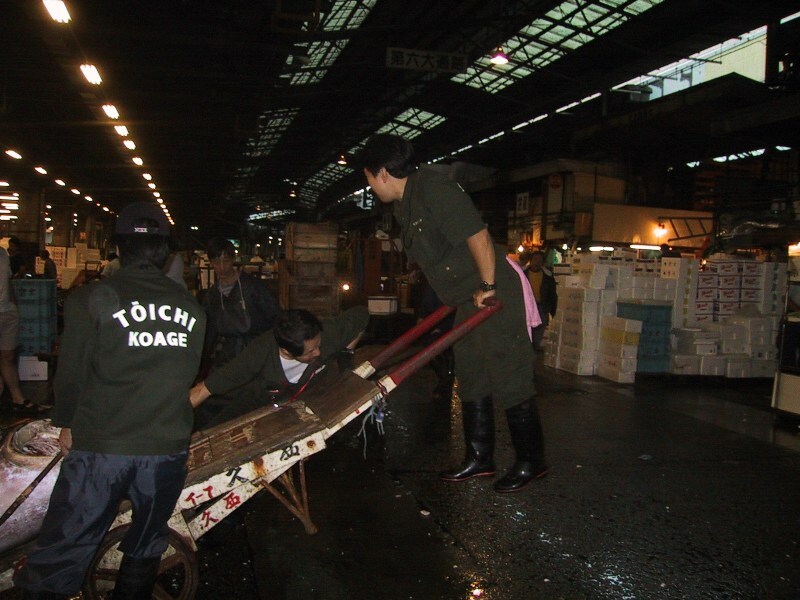 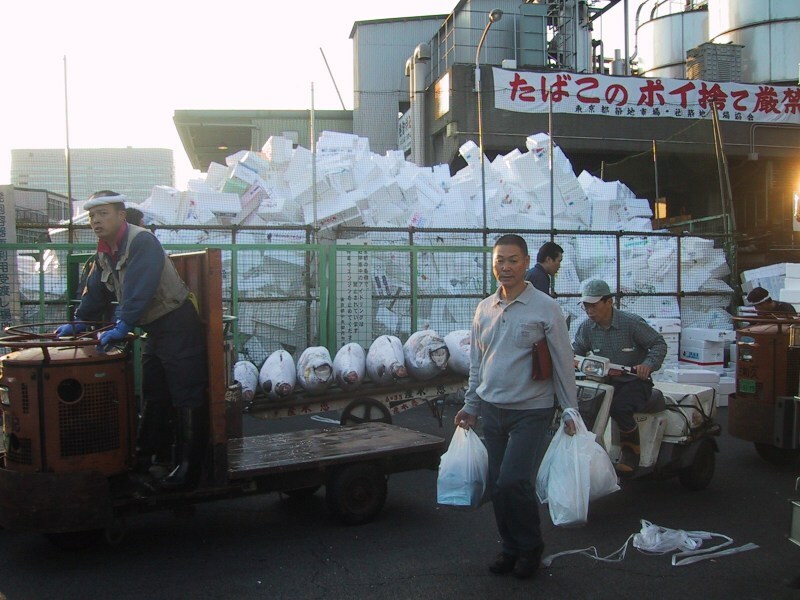 As each fish was won, it was loaded up onto a cart by several men and then hauled away. It was very sad to see the huge mountain of discarded styrofoam outside of the market. 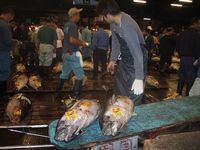 Looking at all of that fish made us hungry so we stopped at a sushi bar on the way out of the fish market for some breakfast. 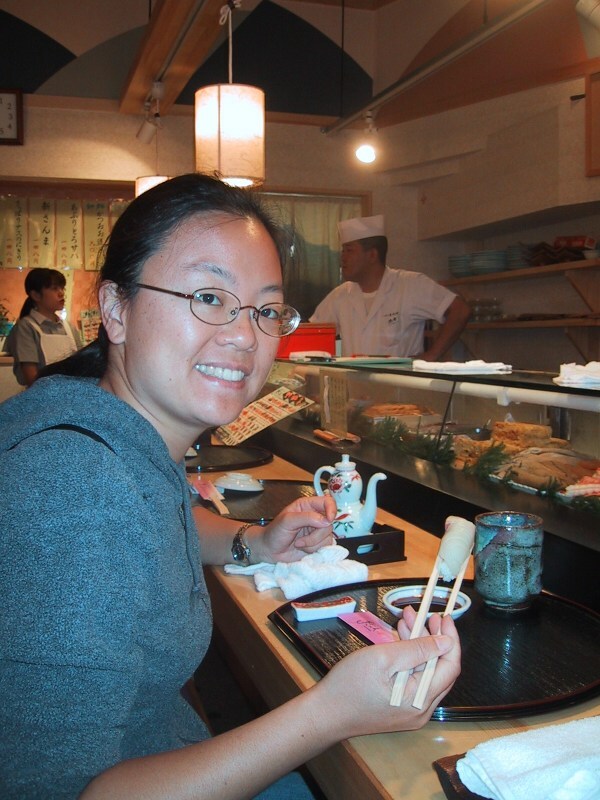 Sushi at the fish market - you can't get much fresher than that! 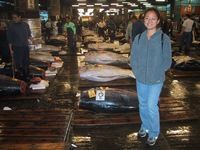 And so concludes the end of our long journey away from the U.S. What a wonderful journey it was, so filled with new adventures and experiences which we will remember for a lifetime.